When you suffer from diabetes, your nerves are at significant risk for damage. Dr. Ortega at St. Luke’s Integrative Medical Center knows that this can cause significant peripheral pain. Using a number of treatment approaches, including the revolutionary use of stem cells, she is committed to giving you relief from your diabetic peripheral neuropathy. If would like to discuss a specialized treatment plan for your diabetes-related pain, call or book an appointment online at our Huntsville, Alabama, office today. Diabetic peripheral neuropathy is a condition caused by damage done to your nerve tissues, the result of an imbalance in your blood sugar. When the tissues of your nervous system are damaged, you may have complications that range from mild tingling in your extremities to loss of limb. Diabetic neuropathy is one of the most common complications of diabetes. An imbalance of blood sugar hinders the protection, regrowth, and proper function of many tissues of the body, including the tissues of the nervous and circulatory system. Often diffuse and widespread, diabetic peripheral neuropathy can affect large groups of nerves. This can mean significant nerve-related pain, but can also cause your skin to lack feeling, especially in your extremities. Combined with a lack of adequate blood flow, this can lead to complications like infection and possible loss of limb. What are the symptoms of diabetic peripheral neuropathy? Symptoms of diabetic peripheral neuropathy usually progress and worsen over time. These symptoms are made worse when blood sugar levels are not well-controlled. Treatment of this condition is important so that further complications are prevented. How can my diabetic peripheral neuropathy be treated? Dr. Ortega and the staff at St. Luke’s Integrative Medical Center are committed to treating your neuropathy with state-of-the-art treatment options. They strive to stop or even regain function lost by your diabetic-related nerve damage. If these options are not sufficient for relief, Dr. Ortega offers a revolutionary approach to neuropathy treatment through the use of stem cells. Using her own specialized techniques, she uses stem cells to encourage new growth and regeneration of damaged nerve tissues. With this approach, healthy nerves are regrown, allowing proper conduction and function, and symptoms are decreased. 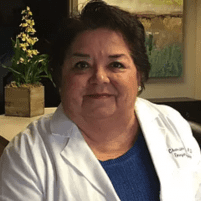 Dr. Ortega is a leading practitioner in the science of regenerative treatments for neuropathies of all kinds, including diabetic peripheral neuropathy. Both she and her team are committed to you having relief from nerve-related pain. For your own specialized treatment plan, call or book your appointment online today.